It's finally December! On its first day, I got myself a gift from Michelis and Belle de Jour Power Planner! I like shiny and sparkling things, though it doesn't necessarily mean jewelry or gems. Being someone who has studied the physical and chemical properties of gold, silver, diamond, or any other special stone... I see them as just as they are: metal and stones. But anyway, I like shimmer... and once gold or silver or diamond is polished, they become things of beauty. 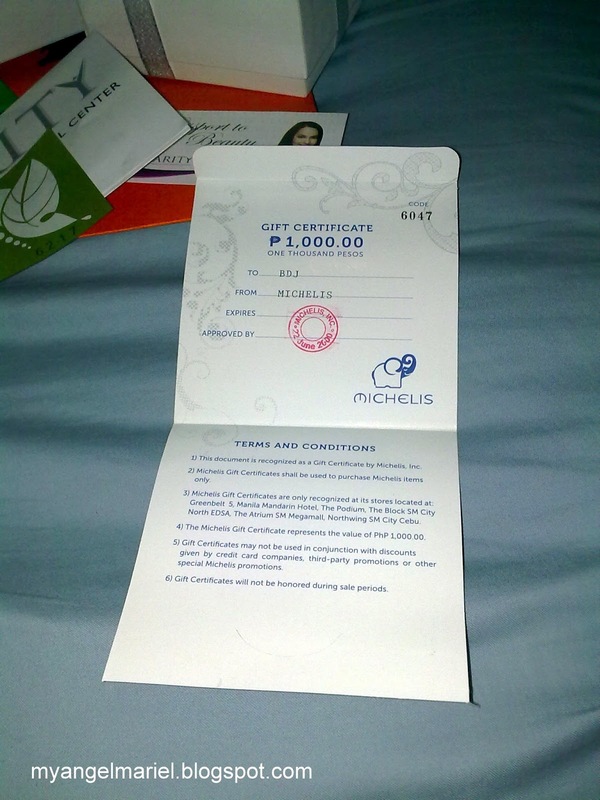 Last BDJ Passion Series: Get Gorgeous Event, a Michelis gift certificate worth PhP1,000 was included in my loot bag. Yay! I was very happy to know that since I also won a necklace that day! I visited the Michelis boutique in Greenbelt 5. I instantly recognized the store's orange and brown color motif. The place was beaming with silver and stones! The staff were kind and they happily assisted me when I chose among the colorful and glittery roster of jewelries. After a few minutes, I finally chose a small pendant. It is shaped like a key and has a rose quartz as a head. It is approximately one and a half centimeters in length. Therefore, it is very small. It is priced at PhP988, just the right amount for my GC. Once done, the staff put the pendant in a brown felt case and then in a cute box. The pendant was given to me in a cute packaging. The Sterling silver that comprises it is well-polished and vibrant. I hope its shine will last for a long time! The heart shaped rose quartz has a color of light transparent baby pink. It is almost not visible. The Heart Key Pendant with Rose Quartz from Michelis. All of my life, the doors have been closed now. And all of my dreams have been locked up inside. But you came along and captured my heart, girl. You're the key to my life. Other than a thing of beauty, this pendant brought inspiration to me! So back to the topic of gemstones and sterling silver, I am so happy to have gotten this special item! Thank you to Michelis and Belle de Jour Power Planner.